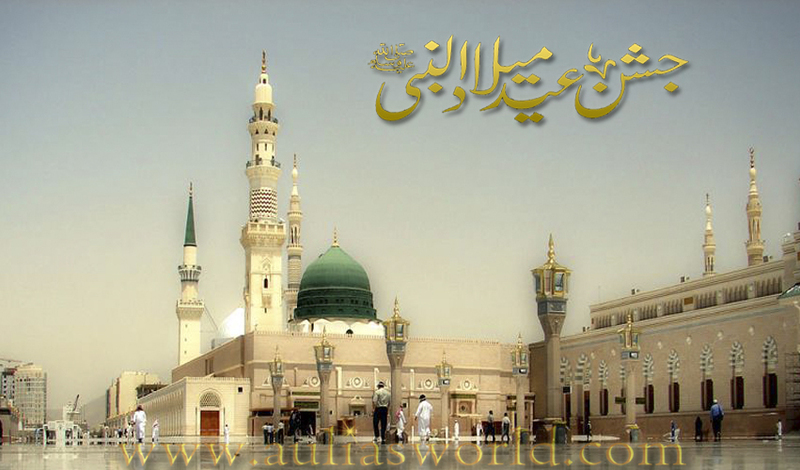 The Holy Prophet of Islam and Allah’s Messenger (peace be upon him) was born on 12 Rabi-ul-Awwal . His birth took place in Makkah on a Monday in the house known as Dar Al-Mawlid, in the year of the Elephant, which corresponds to 571 C.E. Both his father, Abdullah Ibn Abdul Muttalib, and mother, Amina Bint Wahab, were well-known individuals. The Holy Prophet never knew his father, who had died in the months before his birth. It was left to his grandfather to name him Muhammad (s.a.w.). It is incumbent upon Muslims to know the importance of this noble Prophet (pbuh) and to abide by the Quran, which was revealed to him. Rabi'ul-Awwal is the most significant month in the Islamic history, because humanity has been blessed in this month by the birth of the Holy Prophet Muhammad , Sall-Allahu alayhi wa sallam. Before the birth of the Holy Prophet, (Sall-Allahu alayhi wa sallam), not only the Arabian peninsula, but also the so-called civilized nations of Rome and Persia were drowned in the darkness of ignorance, superstitions, oppression and unrest. The Holy Prophet, Sall-Allahu alayhi wa sallam, came with the eternal truth of Tawhid (Oneness of Allah), the only faith which provides a firm basis for the real concepts of knowledge, equity and peace. It was this faith which delivered humanity from ignorance and superstitions and spread the light of true knowledge all over the world. 1) Shereh Bukhari Imam Ahmad Qistalaani (radi Allahu anhu) states in his most distinguished work "Mustataab Mawahibul Laduniyah" that Hazrat Imam Zainul Aabideen (radi Allahu anhu) narrated from His father Hazrat Imam Hussain (radi Allahu anhu) who narrated from His father Hazrat Ali Mushkil Kusha (radi Allahu anhu) that the Beloved Prophet (Sall Allaho Alaihi Wa Sallam) has stated," 14000 years before the creation of Hazrat Adam (Alaihis Salaam) I was a Noor by my creator." 6) It is reported in Tirmizi Shareef that the Prophet (sall Allaho alaihi wasallam) was great in eyes and grand in heart. His face was brilliant, shining like a full moon and was brightly coloured. His forehead was broad, wide and the beard was thick." 8) Hazrat Abi bin Ka'ab (radi Allahu anhu) reports that the Prophet (sall Allaho alaihi wasallam) said, "On the day of Qiyamaah I will be the Leader and Khatib of all the Ambia (Alaihimus Salaam) and I will be the master of their intercession and I do not say this out of pride."